“Tum pahty karega?” The furtive whisper was something of a shocker some 14,000 feet up in the mountains. The only signs of life around (apart from our mysterious party man with the crazy eyes) were mountain dogs, some cows, and plenty of wandering, baa-ing goats. Party animals? Maybe not. 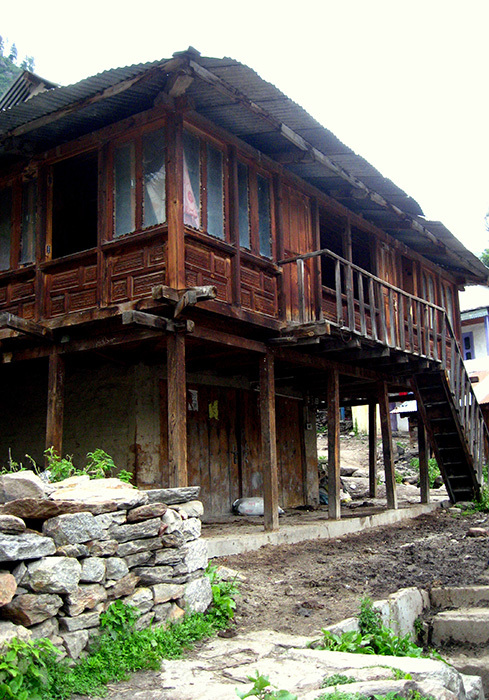 In the little Himachali village of Tosh, peace and quiet was the order of the day, and the prospect of a party was incongruous. 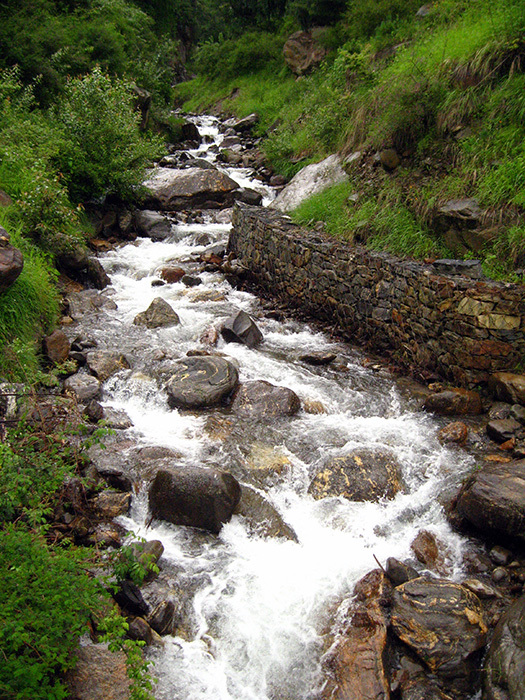 The Tosh River. Photograph by Malavika Bhattacharya. 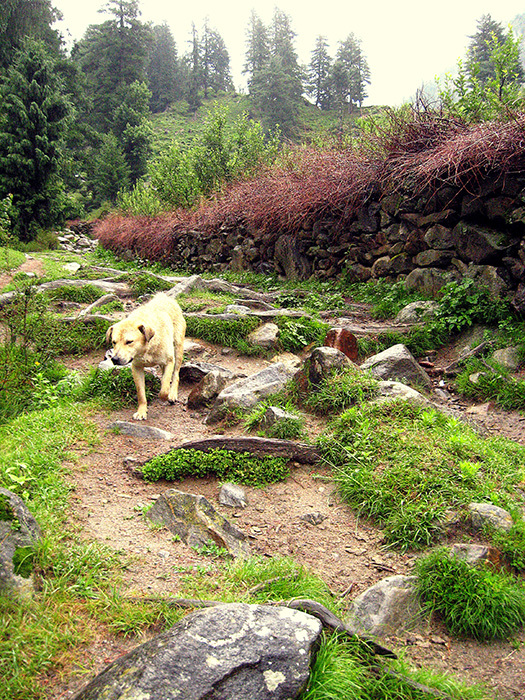 Tosh is literally one of the high points in the famed Parvati Valley circuit. 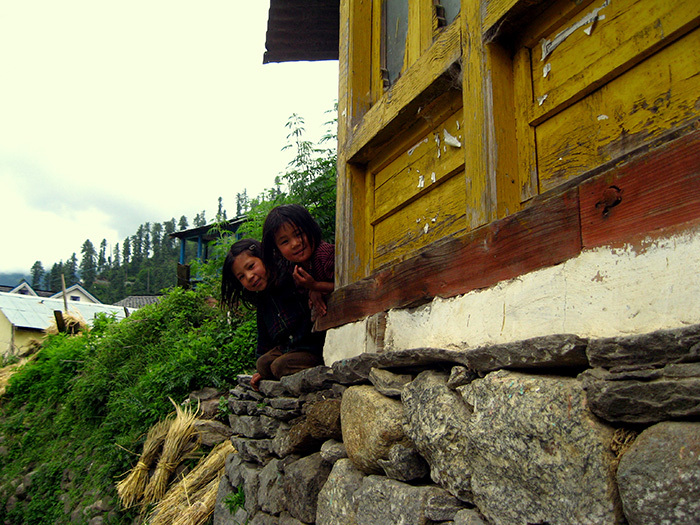 The village is relatively unknown, except amongst trekkers as a pit-stop en route to Sara Umga. 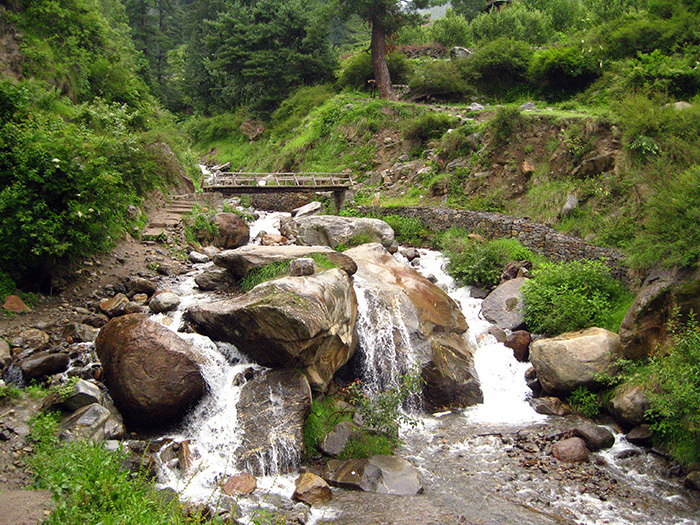 In the same circuit, Kasol is gaining popularity as an offbeat travel destination nowadays. 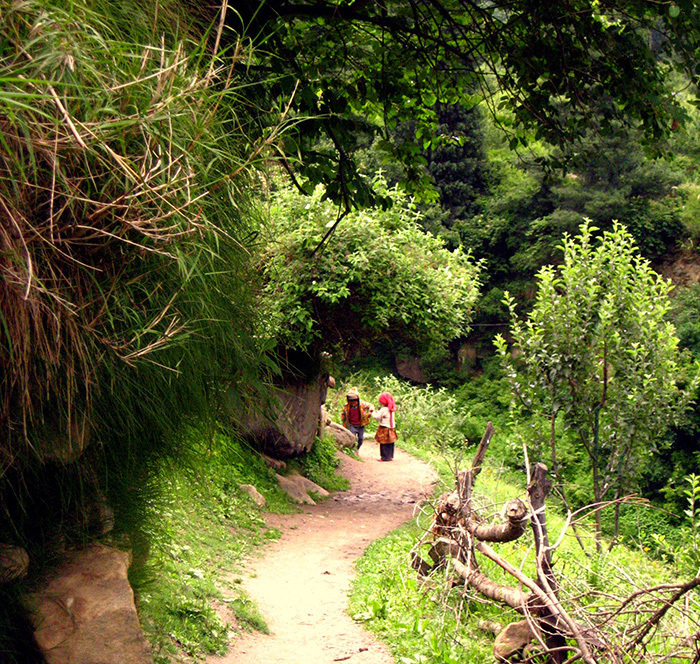 Some even venture into the overcrowded Manikaran a short distance away. Tosh, however, is a world removed. This speck of a settlement doesn’t feature on any tourist maps or bus routes. Entertainment options are few; what you do get is pure, unadulterated acres of green, snowy peaks on the horizon and streams snaking their way alongside you. The Tosh River running through the valley below hums, whooshes and roars at will, breaking the silence so common to these parts. No connectivity, low electricity, limited accessibility—if you’re in Tosh, you’ve fallen off the map! 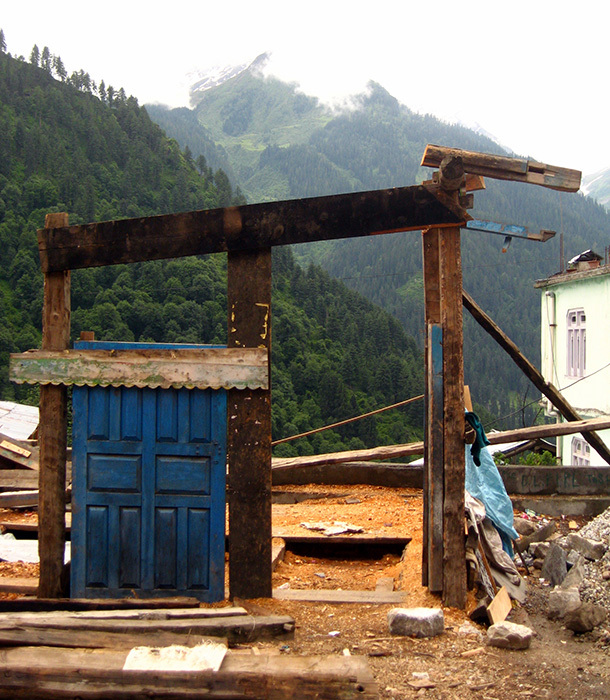 The usual Bhuntar–Kasol–Manikaran bus route has its last stop at Barshaini. 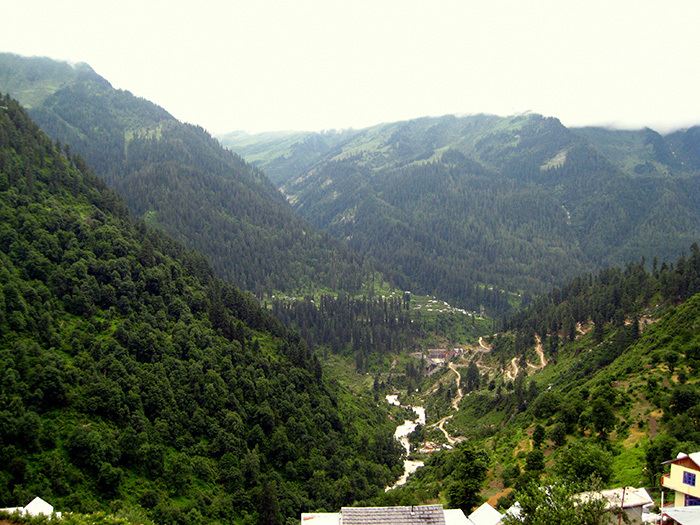 The one-and-a-half hour stretch from Manikaran to Barshaini is a series of hairpin bends, gravelly roads and heart-in-your-throat moments, but offers some magnificent views as solace. 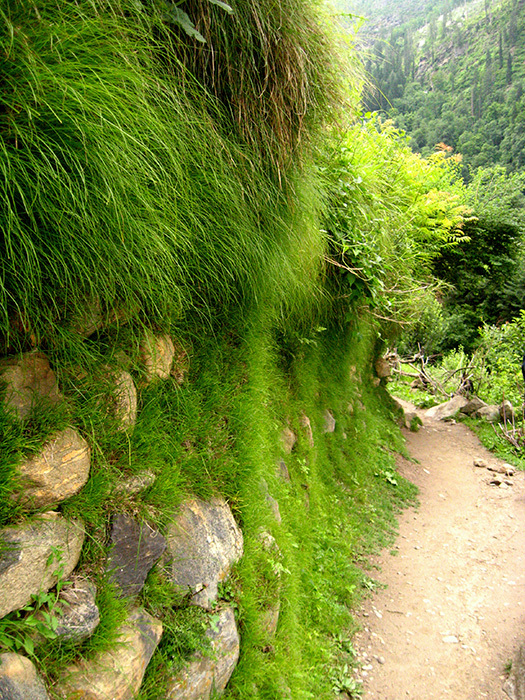 Barshaini is where the roads cease to exist, and those headed to Tosh proceed on foot. 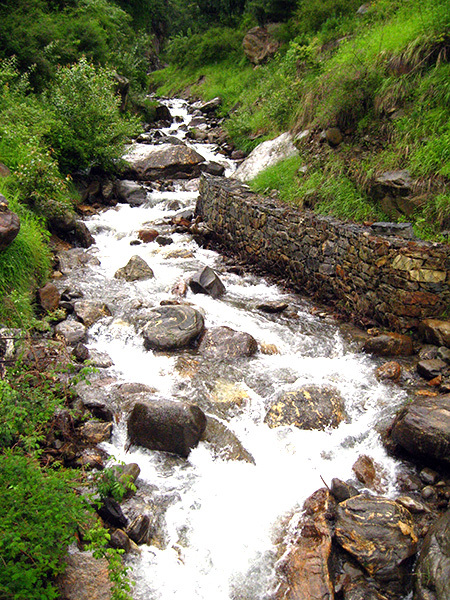 The trek uphill takes around 3 hours and follows the course of the river, leaving no chance of losing your way. 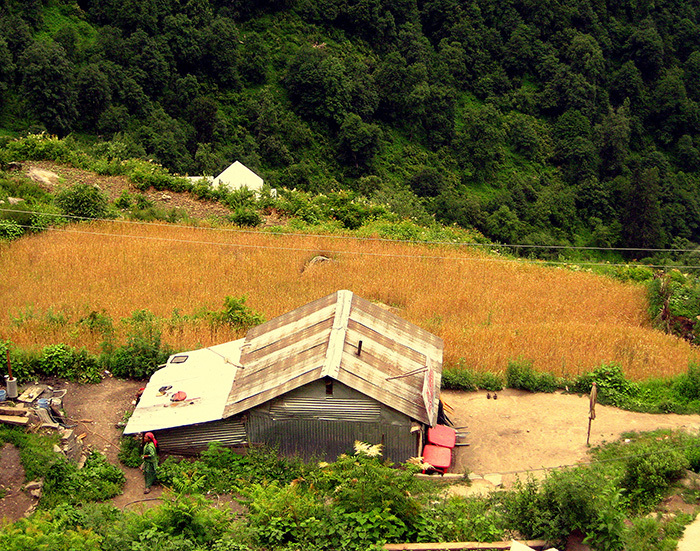 Cabs to Tosh are sometimes available from Barshaini, for those willing to risk driving on the non-roads. 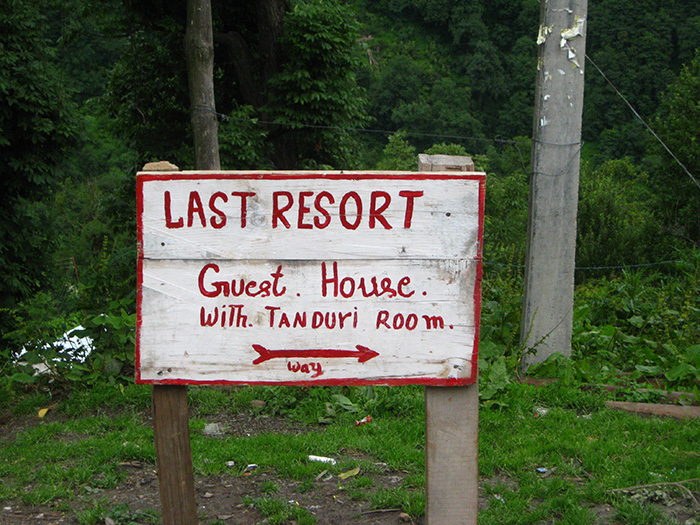 While trudging through the village looking for a place to crash, many locals pointed us one way or the other, excitedly mentioning ‘Tandoori Rooms’. I did not want to end up as someone’s dinner, so we trudged on until, out of nowhere, appeared a three-storied purple-and-green cement structure. The biggest establishment in Tosh, the Olive Garden would be my palace for the next 24 hours. I even settled for a Tandoori Room, provided they didn’t actually fire it up. Mr. D, the friendly caretaker (a.k.a. Party Man), went about getting us blankets and hot drinks, all the while offering us all sorts of specialities available only in these parts. Even this far removed from civilisation, hippie influences were everywhere. 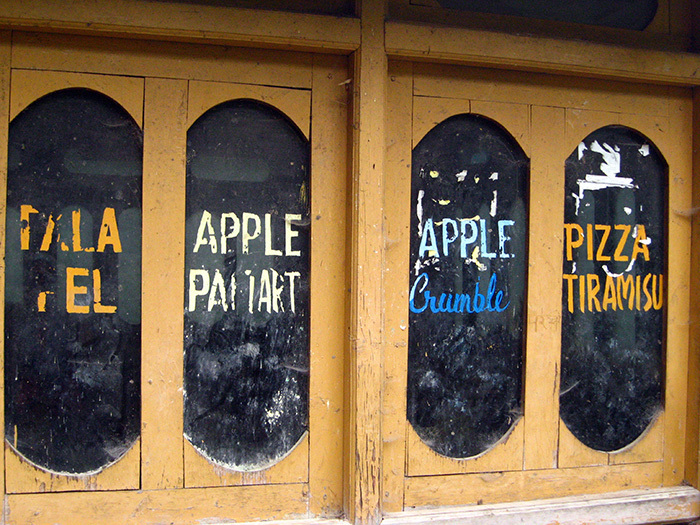 The smallest wooden shacks had been turned into Pink Floyd cafés, playing loungy music and serving falafels and pancakes. Across from our room, a thatched wooden structure on stilts looked warm and promising. We climbed the ladder to emerge into the Olive’s very own resto-lounge. A ‘tandoor’ in the center kept the chill out, while the full-length glass windows provided a fabulous view of the misty valleys and the sheer drop below. Flopped down on the comfortable mattresses, we surrendered to Mr. D’s cheesy olive-sausage pizza, fritters, and much needed tea. Energy levels back up, it was time to go explore. As our furry little mountain guide led us through meandering trails, I couldn’t help but imagine little hobbits jumping out in front of us. The setting was very L.O.T.R.-esque, with walls of soft moss rising up on one side and overhanging rocks providing shelter from the rain. Apple orchards sprung up in the distance, across the swelling stream. Some agile cows led the way up precarious rocks and slippery stones and got us safely across the water. And that’s when the valley erupted in a sudden volley of thumping beats. A wave of sound came unsk–unsk–unsking across the mountains, bringing with it images of crazed dancing in the rain. Party Man was not delusional after all; somewhere in these mountains, some dudes were having themselves a jolly good time, come rain or shine. Huddled under an outcrop of rock and soaked to the bone, we pulled off some of our best party moves while waiting for the rain to let up. Ah, sweet isolation! Back at the Olive Garden, I watched in awe as Mr. D rolled out the mother of all speakers, about the same height as I was. Apparently this was the site for the next ‘Full Moon’ party, a common feature in these mountains. Every fortnight or so, car loads of party animals are driven off to an undisclosed location in the valley, armed with their speakers from hell and dancing shoes. And when this valley parties, all the surrounding mountains party with it.